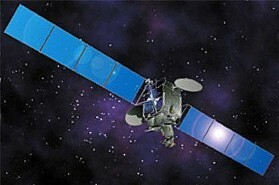 Bentley Walker have their fifth Hughes HX hub, on Telstar 11N satellite operating in the beam shown below. Service start May 2009. Telstar 11N is located at 37.5 degrees West and utilizes 39 high powered Ku-band transponders to support video and data applications in North America, Europe and Africa and across the Atlantic Ocean. The satellite's African coverage is promoting the implementation of broadband and video services across the continent and enabling a broad range of users to seamlessly connect their African operations with Europe and North America. Telstar 11N satellite at 37.5 West orbit position. 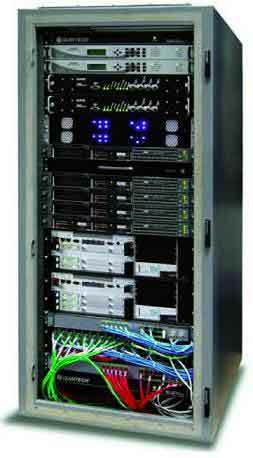 HX VSAT hub equipment rack. Telstar 11N was manufactured by Space Systems/Loral (SS/L) and Sea Launch provided mission management with its Land Launch partner, Space International Services Ltd. Telesat's newest satellite uses SS/L's proven 1300 platform, has a solar array span of 31 meters and an expected 15 year mission life. The HX50 is a high-performance customer satellite modem/router designed to support high-bandwidth links with Quality of Service (QoS) features such as Min/Max CIR together with dynamic allocation of bandwidth. With integrated IP features including NAT/PAT, DHCP, RIPV1, RIPV2, and DNS server/relay functionality, together with TCP acceleration and a high-performance satellite modem, the HX50 is the ideal platform to enable high-performance IP connectivity for a variety of applications including internet cafes, community ISP, cellular backhaul, MPLS extension services, virtual leased-line services, and other high-bandwidth solutions. Two 10/100BaseT Ethernet LAN RJ45 ports offering the ability to offer dual subscriptions. Information on this page kindly provided by Bentley Walker. For information only. This is not a paid for advertisement.